- Ladies start with 15,000 in chips and the levels are 30 minutes in length. - Players start with 25,000 in chips and the levels are 50 minutes in length. Adam Ross Wins the $400 Deep Stack Event! Adam Ross is the champion of the $400 No-Limit Hold 'em Deep Stack event. He takes home $19,570 and the World Poker Finals Trophy! The board runs out [3d][3s][2d][7h][6d] and Ross takes the pot with his ace-king. Thomas Paschal has been eliminated in 2nd place and takes home $17,569 plus the watch. Daniel Darmiento raises to 230,000 from the small blind and Adam Ross calls from the big blind. The flop comes [Qc][Ts][8s] and Darmiento moves all-in for 505,000. The turn is the [Td] and the river comes the [3h]. Ross wins the pot with his pair of queens and eliminates Darmiento in 3rd place for $14,467. We had a total of 107 players in the $400 H.O.S.E. 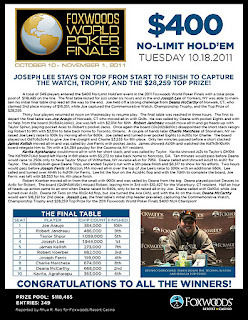 event at the Foxwoods World Poker Finals. The board comes [Qs][6c][4s][6h][5c] and Ross's pocket aces hold up to win the pot and eliminate Teklu in 4th place in $11,733. John Cammuso gets all-in before the flop with [Qc][Qh] against the [Ac][Ad] of Thomas Paschal. The board rus out [9c][7c][2d][4c][Jd] and Cammuso is eliminated in 5th place for $9,000. The board runs out [Jd][8h][2h][2c][3d] and Ross wins the pot to eliminate Caputo in 6th place for $9,000. The board runs out [Js][3h][3s][5s][4s] and Paschal pairs his jack to win the pot and eliminate Oh in 7th place for $9,000. The board runs out [8d][5c][4d][8s][7c] and Ross ten's win the pot to eliminate Donnelly in 8th place for $3,832. Robel Teklu raises to 130,000 before the flop and Anthony Lundy moves all-in for 340,000. John Cammuso calls from the button and Teklu calls as well. Teklu has the lead with a pair of jacks but Lundy is four to a flush. The [6s] completes Lundy's flush but the river is the [6d]. Teklu makes a full house on the river to win the pot and eliminate Lundy in 9th place for $3,163. 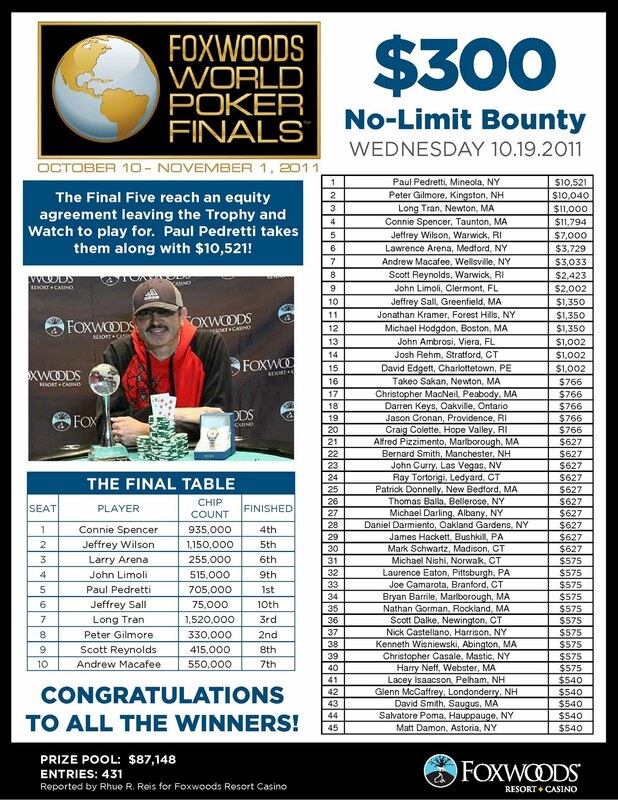 The board runs out [Jh][9c][2d][7d][Ac] and Donnelly's pocket tens hold up to win the pot and eliminate Lima in 10th place for $2,136. 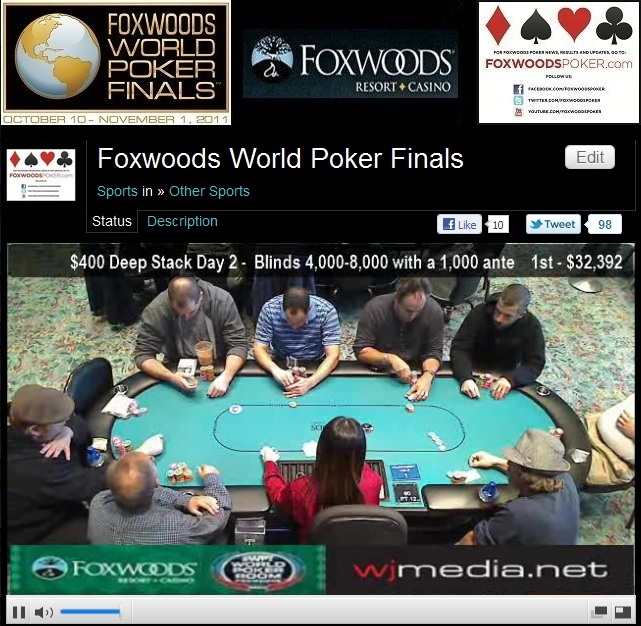 We had a total of 281 players in the $500 NLHE Deep Stack Bounty event at the Foxwoods World Poker Finals. Day 2 of the $400 Deep Stack No-Limit Hold 'em event is now streaming live. 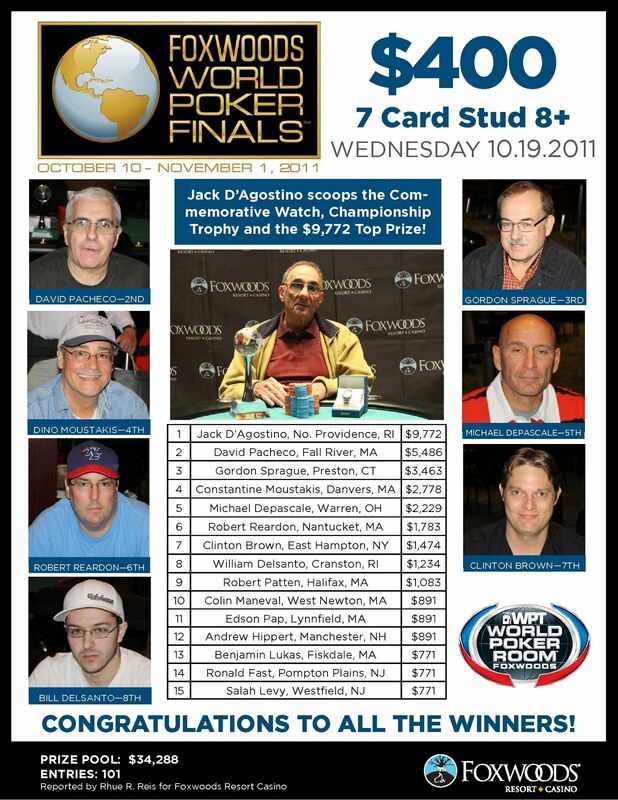 Jack D'Agostino Wins the $400 7-Card Stud 8+ Event! Congratulations to Jack D'Agostino, winner of the $400 7-Card Stud Eight-or-Better event. He takes home $9,772, the World Poker Finals Trophy and the watch! $500 Bounty Deep Stack Event Underway! 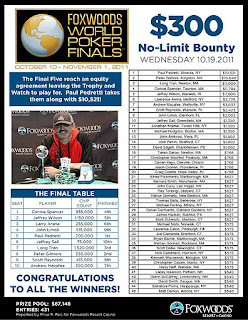 The $500 No-Limit Hold 'em Bounty Deep Stack event at the World Poker Finals is now underway. You earn $100 for every player you eliminate.